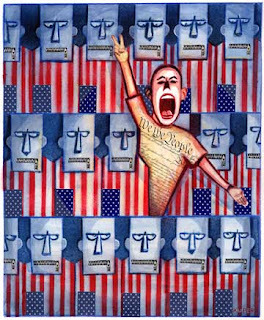 America Revealed: 2011: "Dissent is what Rescues Democracy"
If not already obvious, 2010 has made clear that the US government does not care a whit for the opinions of citizens. The TSA is unequivocal that it will reach no accommodation with Americans other than the violations of their persons that it imposes by its unaccountable power. As for public opposition to war, the Associated Press reported on December 16 that “Defense Secretary Robert Gates says the U.S. can’t let public opinion sway its commitment to Afghanistan.” Gates stated bluntly what has been known for some time: the idea is passé that government in a democracy serves the will of the people. If this quaint notion is still found in civics books, it will soon be edited out. 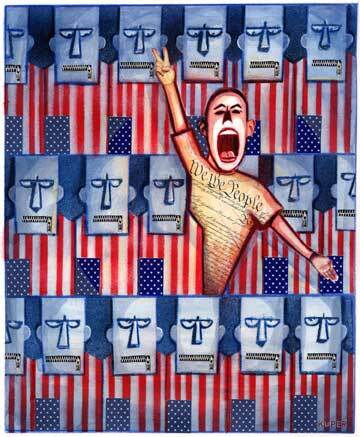 As 2011 dawns, public discourse in America has the country primed for a fascist dictatorship. The situation will be worse by 2012. The most uncomfortable truth that emerges from the WikiLeaks saga is that American public discourse consists of cries for revenge against those who tell us truths. The vicious mendacity of the US government knows no restraint. Whether or not international law can save Julian Assange from the clutches of the Americans or death by a government black ops unit, both executive and legislative branches are working assiduously to establish the National Security State as the highest value and truth as its greatest enemy.